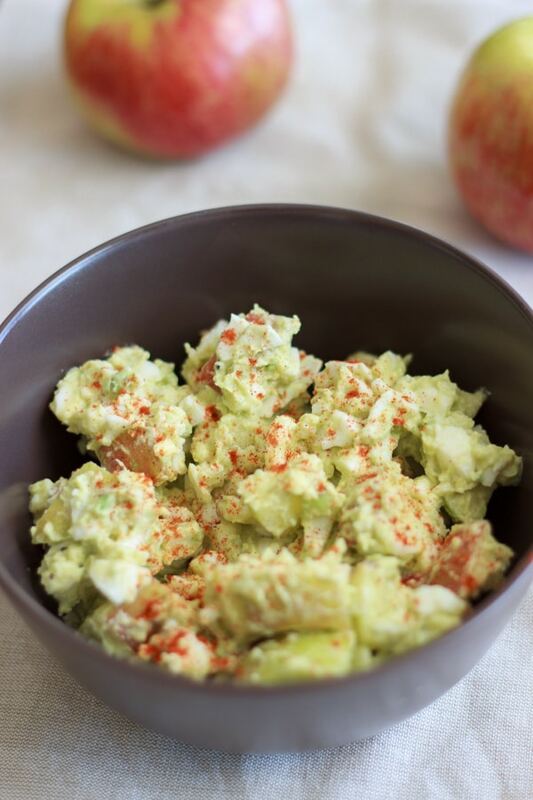 No mayo egg salad with avocado and apples. Perfect combination of crunchy and chewy, without the extra calories of mayonnaise. You guys, I am really excited about this one. For some reason I don’t really get a craving for eggs very often. So when I say I think I could eat this egg salad all the time, that’s a big deal. 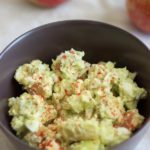 Recently I heard someone mention something in passing about apples with egg salad, and that made me want to try it immediately. 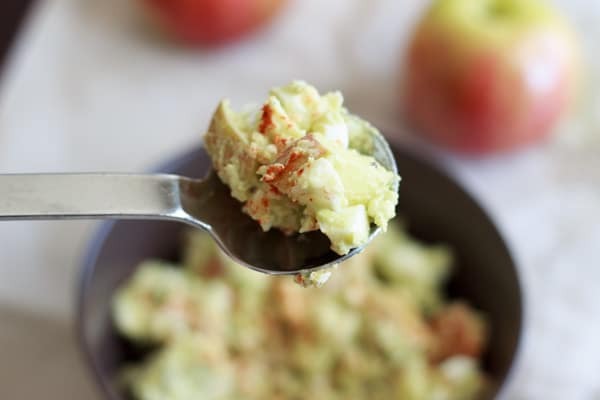 I like apples in salads, so why not with egg salad? Why I hadn’t ever heard of this before, I don’t know. When I ran to the kitchen to start making some, I realized that I didn’t have any mayonnaise. And I got sad. Then I realized I could substitute avocado, and I was happy again. Avocado always makes me happy. You don’t have to top off with paprika (I tried it without – it still tastes good! 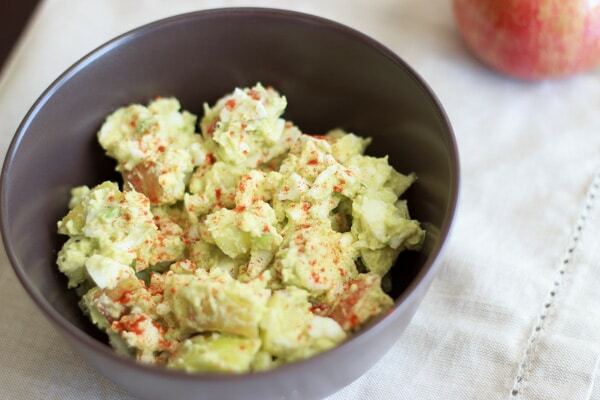 ), but I added some just because that’s what I think of as a traditional egg salad spice. My thought was I would have some left over for lunches this week. But I may or may not have eaten the entire 4 servings in less than 24 hours. A little bit of added yogurt helped with the consistency and blended the avocado in with the eggs a little better. I used regular vanilla yogurt, but I’ve heard of other people using greek yogurt if you want to go fancy. Top it off with a pinch of paprika and you’ve got yourself a healthy (and delicious!) egg salad. 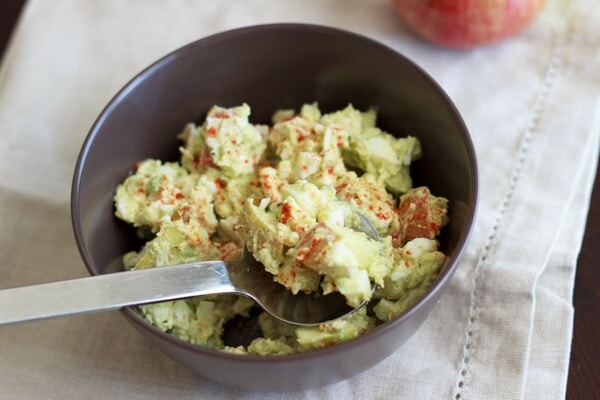 No mayo avocado egg salad with avocado and apples. Perfect combination of crunchy and chewy, without the extra calories of mayonnaise. 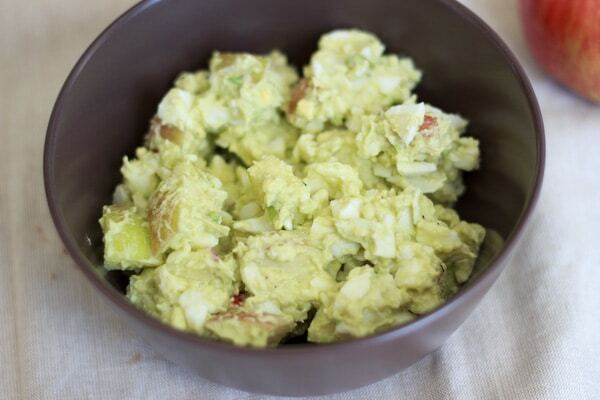 In a large bowl, combine eggs, avocado and yogurt and mash until blended. Sprinkle in salt and pepper and blend. Serve cold over bread or plain. Top off with a pinch of paprika if desired. Love the idea of adding apple to this! This sounds and looks delicious. Can’t wait to give it a try! Oh this looks really good, pinned!